John A. Strong. Running on Empty: The Rise and Fall of Southampton College, 1963-2005. Albany: Excelsior Editions, SUNY Press, 2013. Pp. 325. ISBN: 9781438446967. $85.00 cloth, $29.95 paper. 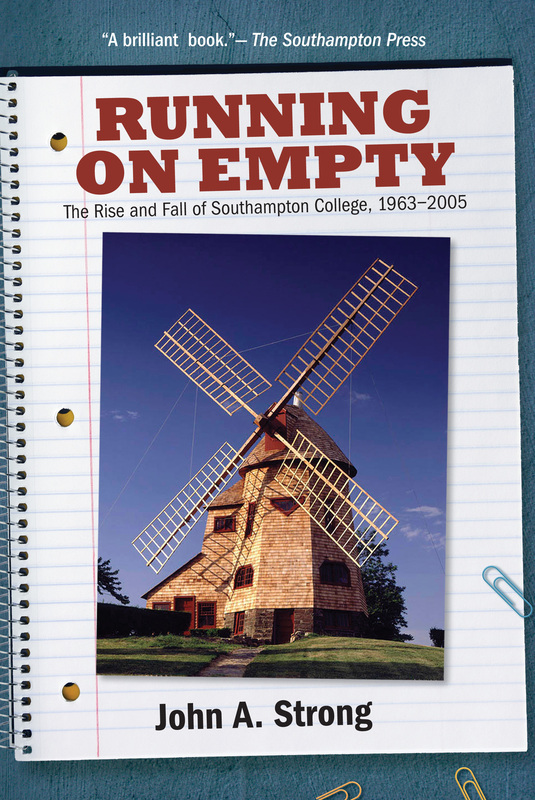 This is an exceptionally well-written narrative history of the Southampton branch of Long Island University. In many ways, the tale of the Southampton campus, an outlying branch of LIU that was set in eastern Suffolk County, is the tale of a college’s doomsday that had often seemed imminent long before actual closure came in 2005. From the start the college was underfunded, too small, without affluent local links or resources, saddled with a problematic physical plant, and had no sympathetic view of its autonomy at LIU central. On the other hand, as Strong’s story tells with clarity and conviction, it survived for over four decades thanks to the loyalty of faculty and staff and of many of its students (and, eventually, of its alumni, a good proportion of them remaining in the neighborhood). Strong joined the Southampton faculty in 1965 and retired in 1998. During those years he was one of an impressive number of long-serving and loyal faculty; he taught history, helped with many administrative tasks, and wrote books on Native-Americans, focusing on those of Long Island. He writes here as a participant observer, defending the college against inept or even hostile administrators, who were sent out east from LIU “headquarters” in Brooklyn or from the C.W. Post campus in Brookville (in Long Island’s Nassau County) or – even less helpfully – remaining at the home branches of LIU and dictating from afar. The creation of the Southampton campus in 1963 takes us back to an era of the expansion of higher education and to speculation about the future of Long Island as suburbia flourished and population grew. There was an educational vacuum to be filled; even with Adelphi looking east (and establishing a campus that would eventually become Dowling College) and with the State University of New York at Stony Brook’s great expansion already under way, a college still farther east seemed worthy of a try. Perhaps a small private college to cater to local needs, especially to the needs and aspirations of students with mediocre high school records who would try a local campus, seemed a possibility. When LIU in Brooklyn began to expand from its urban origins, a branch campus “all the way out there” looked like a reasonable gamble. From the start, real problems were ignored and/or denied. There was never any serious endowment, even when LIU had money to invest. There were sanguine but untested – and ultimately erroneous – predictions about the way the wealthy of the Hamptons would embrace a local college; wishful thinking, not market research here. The physical plant never caught up with use and demand. Furthermore, low-achieving students meant a high attrition rate, probably fatal for a school heavily dependent on tuition. Despite these problems, the college lasted for four decades, built a first rate marine sciences program, taught research methods to hundreds of undergraduates, developed study-abroad programs and field trips around the world, worked to bring cultural events to the South Fork of Long Island, and pleaded with the LIU commissars to give it a better break than they were inclined to do. The narrative is well written, if admittedly (and unashamedly) on the side of survival. For a college to fail and go out of business was common in the 19th century, but we have very few such accounts from recent years, certainly not many by insiders, so this is a valuable record. A few reader-friendly insertions would have helped to clarify the wealth of detail. A map of Long Island would add substance regarding problems exacerbated, if not caused, by the distance between Southampton and LIU headquarters at the C. W. Post campus in Brookville. A map or diagram of the campus would clarify the questions of buildings, old and new, as well as locate the proximity of the various bodies of water used by the marine sciences program. And a chart or table showing the administrators at headquarters and those on location would help keep straight who was (nominally) in charge, and when, and how the local officials meshed (usually not very well) with those at LIU’s main campuses. As the histories of institutions of higher learning read, this volume is a page-turner. Before the lugubrious ending came, we have many instances of valiant struggle, of lessons that might have been learned, and of the commitment of so many, at all levels, to keep the college going as long and as well as possible. Ultimately, it is a sad story, a moral tale with an unhappy ending – but the story is very well told.